There is widespread reporting on a landmark county lines prosecution in which a drug dealer has been imprisoned for trafficking children. The papers report that a drug dealer who exploited children to run a county lines crack cocaine and heroin gang has been jailed in what is being reported as a “landmark” prosecution. Zakaria Mohammed was given a 14 year prison sentence and is the first drug dealer to be jailed for breaching the Modern Slavery Act by trafficking children. The papers report that Mohammed groomed three teenagers before making them sell drugs from squalid flats. They were taken from their homes in Birmingham and Lincoln and found in a flat surrounded by used syringes. The grooming and exploitation of vulnerable children in any form is disgusting and today’s sentence highlights that those committing these appalling crimes will face tough sentences. I would like to thank the police and everyone involved in bringing this criminal to justice. Alongside using modern slavery legislation to prosecute these criminals, our new National County Lines Coordination Centre will significantly strengthen the law enforcement response to this issue and enable police forces to work together to tackle a crime that crosses regions. There is reporting in the Guardian and Independent on the Court of Appeal’s ruling that the Home Office may have been unlawfully detaining thousands of asylum seekers while their immigration cases were being assessed. Judges ruled yesterday that potentially hundreds of people, may have been wrongly placed in immigration removal centres while their claims were considered under the Dublin III regulation. Under Dublin III regulations, asylum seekers must claim asylum in the first safe country they reach. 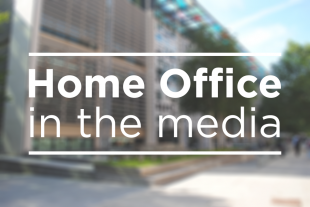 Yesterday, senior judges ruled that the practice of detaining people indefinitely while discussions take place between the Home Office and other European countries for their transfer was unlawful. The appellants in the case, five men from Iraq and Afghanistan who were detained between January 2014 and March 2017, were not, by the Home Office’s admission, deemed to be in the Dublin III category, the Independent reports. We are disappointed with the Court’s ruling and are carefully considering the next steps.